We already know that Google's I/O 2014 conference will be a place where, among other things, wearables are going to have an important role. What we didn’t know was that Samsung may announce its very first Android Wear-based smartwatch there. According to CNET, the upcoming Samsung Android Wear watch will be "much like the Gear devices Samsung has released in the past year," and all Google I/O attendees might receive one. It’s said that Samsung is working on two different models: one using an Exynos chipset, and another one based on a Qualcomm solution. It’s not clear which of the two will be announced at Google I/O. In any case, the new smartwatch could be the Samsung SM-R382 that was spotted at the FCC last week. Google I/O will be held in San Francisco between June 25 and June 26. Besides Samsung, LG and Motorola will most likely also showcase their Android Wear smartwatches during the conference: the LG G Watch and the Moto 360. LG’s G Watch will probably be the first to start shipping, with sales expected to begin in early July. 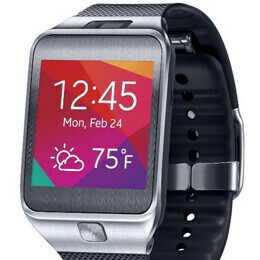 Note: the smartwatch pictured above is the Tizen-based Samsung Gear 2. This year's Google I/O is shaping up to be quite monumental. Good to see Samsung showing its engineering flexibility by truly leading the way with 'wearables' rather than sitting back and mooching off the development groundwork being laid by other companies. Google Wear bodes well for the future of 'wearables' and there's little doubt that the next Android version will be impressive as well. So, a watch every other month that they have been in the wearables market is "leading the way"? Good to know. At this pace, they will be on the Gear X before 20 months has passed. You can't sell what you don't have. People are buying plenty of Samsung product including Apple inc. I'm sure Casio, Fossil, Movado, Swatch, Omega, and Invicta have survived for so long by only releasing 1 watch per year. Or, maybe they release a lot more and have people working for them that know a whole lot more than me about the number of devices they should make and when they should ship them. Lol, I'm with you. They just can't seem to produce anything aesthetically pleasing, unless they copied it. yeah, i have a Galaxy S5 and literally the only things i really like about it are the Camera and the Display which i still think is too large but still gorgeous and the fact that i can cover it with a Spigen Case because i looove Spigen Cases. This will really get my attention if it is compatible for all Android phones. The Gear 2 is actually really nice when you hold it and wear it and the 360 looks too bulky. Gear 2 hardware with Android wear software. I really like the feel of the Gear 2 on my wrist. Maybe it is like Apple and their move from PowerPC to x86 and Samsung just wants to be ready to flip the switch. This should be great. I really like Gear 2. Can't wait to see how 'Android wear' looks on it! I'm confused android wear what's the difference between the one the have out now ?? Ok so this next one will be available to work with all Android phone like the pebble. I'm kinda sadden that SONY won't make a ANDROID WEAR watch like the MOTO 360.